I just dropped my Wife and Kids to the Airport as they fly to London for a few days. Perhaps it’s natural, then, that my thoughts would fly in that direction also. I have a passionate – and slightly odd - relationship with London in my head and it isn’t the relationship I thought it would be when I left Dublin in 1983. After completing third level education in Dublin, I was of the belief that I hated cities and wanted nothing more to do with them. I don’t blame Dublin for this – it wasn’t you, Dublin, it was me. I was just too young for cities. I managed fine and had many a good time in my three years there, I just never developed a relationship with the place. It’s still true to this day – I love to visit Dublin and I enjoy spending some time there but there’s an edge to it and, deep down, I fear that someday I might be required to live there again. …fourteen years later and it was time to leave London. My wife and child had gone on ahead, back to Ireland, and I had a week to pack up the house and get it ready for the removal men. A week on my own to say goodbye. 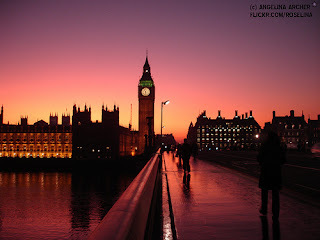 I had fallen in love, you see, with London. I had got on the ferry from Ireland and watched the shore slip away behind me and I had berated myself for having to play out this most tired of clichés in this most modern of times. I had caught the train at Holyhead (along with my friend Damian) and had arrived in London and made my way to Kensington where our friends had a flat and, yes, almost immediately, I had fallen in love with the place. It was hard not to. I was the right age now to want to live free and that’s just what London provided. But it wasn’t just that. I loved the scale of the place, the anonymity, the endless possibilities. I didn’t ever really want to be anyplace else. So, for fourteen years, we lived the full London experience. We went everywhere and did everything. We worked bloody hard too. I mean bloody hard but the work was somehow part of the life rather than an exception to it – testimony perhaps to the quality of the people I was blessed enough to work with. And then, 1997 arrived and Trish and I were no longer just a couple. We were a family now and the imperative existed that our family would do better in Ireland than it would in London… and a job arose so we jumped, for the sake of family, we jumped. And, yes, it took a little time but it’s all worked out very well. I used to have a fantasy of living in a little place where I was on speaking-terms with loads of people – a bit like the Steve Martin character in ‘Roxanne’ and here I am and I love it. But my relationship with London had been quite intense so here’s where it gets a little strange – I left in February 1997 and I have never once been back since. Not once. I still think of London very often and love tweeting with my London friends. Every year, I promise myself I will nip over and look around and I never do. It would take another post to try to analyse the reasons for this, suffice it to say I don’t think they are overly simple. But then, what is? So anyway, there I was faced with my last evening in London, all on my own and what should I do? I did what I had done so many times before, I went to Leicester Square and caught the latest movie. That odd encyclopaedic-like knowledge I seem to retain of practically every cinema visit I’ve ever had tells me what film I saw that evening. It was ‘Ransom’ with Mel Gibson and I really quite enjoyed it. Afterward, it was late but I didn’t want to go back to the house yet (already it was no longer home) so I walked. I ended up at Westminster Bridge - on the Trafalgar Square side. This bridge had been an icon of London for me since I had first come here on a college excursion when I was seventeen. The illuminated underside and the sheer presence of the structure, as well as its amazing location, had all impressed me greatly. I fancied I would stroll across it one more time but, when I got to the riverbank, I found the bridge was barricaded-off and completely empty. A workman told me it was closed for the night for road repairs, which were due to start at One a.m. It would be open again in the morning. I would be a hundred miles up the motorway in the morning. Amazingly, he let me slip through the barrier. So it was that, on my last night in London, I stood, all alone, in the middle of the road in the middle of Westminster Bridge at midnight and I looked all around at the fabulous sweep of that fabulous city and I said goodbye. I may go back for a weekend visit this year. I’ve been saying that for a long long time now. I particularly remember the paperboy's papers only had typeface on one side... the illusion of film eh? Anyway, Watson grabbed the newspaper a little too enthusiastically, in one of the takes, and he ripped it in two. I couldn't resist piping-up 'That's torn it Watson!' and I got an appreciative laugh and applause from cast and crew alike. Being an American, I rarely see places with as much history as London and Ireland. I'm intrigued by them both and hope I'll be able to visit there someday. How cool would it be to trod the same paths (well, sort of the same) as Shakespeare et al! oh dear. That's made me want to go back . I just came home. My wallet cannot handle these emotions . I have never been to London. I’ve been to all Scotland’s cities bar Inverness which I drove past but didn’t have the time to visit. When we used to go car trips – not Carrie-and-me-we, a whole different ‘we’ – we’d get in the car, look at the map and say, “Dundee! We’ve never been to Dundee – let’s go there.” We were not impressed. I think we wandered around the town centre for about an hour, got back in the car and went someplace far more interesting. (The only other place to inspire us less was Cumbernauld). Edinburgh has a similar feel to the Dublin I experienced – nothing but foreigners as far as the eye can see although back in the eighties when I spent most time there it was a place I quite enjoyed exploring. I spent six months in Aberdeen and swore I would never go back – and I never have – I found it an inhospitable place and colourless. Carrie and I went to Stirling once – I tend to forget it’s a city – and didn’t visit the castle (we also went to Edinburgh and didn’t visit its castle either) but I did buy her a nice set of craft knives. Glasgow is by far the best city in Scotland – the only other British city I’ve visited by the way was Newcastle – for a whole host of reasons and what I liked about San Francisco – the only other city in the world I’ve visited (I don’t count New York airport) – was that it reminded me of Glasgow . I really can’t imagine living anywhere else frankly and if I never see London before I die I won’t worry about it. Imagining you alone and standing there at the middle of a bridge in the night painted a beautiful picture for me that brought tears to my eyes. How I wish I could do that too at times when I need to. Your description was so vivid it brings back memories of how I use to go to the mountain top early morning when I was in the boondocks to watch the scene below. I miss those times too. I do hope your wish will be granted soon. God bless. Terry: I hope so too mate. There is *so* much in these places to delight you. Knitkat: I've greatly enjoyed reading about you London adventures so, yes, you're really got to go back again soon.